Author of the great succès de scandale of 19th century literature, on January 1857 Gustave Flaubert and his publishers were taken to court for "outrage to public morals and religion." Madame Bovary was the reason for the scandal. But while adultery and earthy language were the reasons why Flaubert was (unsuccessfully) prosecuted, he might just as well have been prosecuted for poor penmanship. Had he been in Mrs. Stallone's third grade cursive writing class in P.S. 2, he'd still be at his desk with her standing over him drilling on flowing curves and fancy loops. 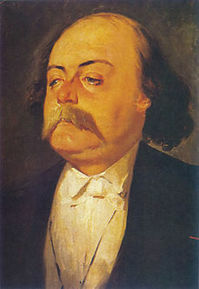 Flaubert was a compulsive-obsessive writer. As Brigid Grauman writes in the Wall Street Journal "The nihilistic, anti-bourgeois Flaubert spent four-and-a-half years writing it, sweating over every word, every sentence, every paragraph...Flaubert's obsession with style is legendary, down to his technique of bellowing his sentences out loud to make sure they worked musically, like poetry. His identification with the bored, highly strung, aspirational Emma Bovary is also widely documented. What is less well known is that he kept every one of the novel's many drafts, going so far as to say that he wanted to be buried with them." That did not, fortunately, occur. 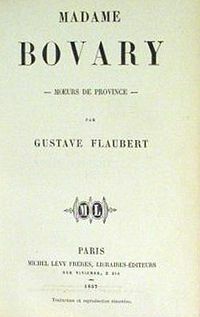 After the novelist's death, his niece, Caroline, donated the manuscript to the Municipal Library of Rouen, the French town where Flaubert wrote the book. Seven years ago, the Library decided, despite a lack of funding, to make every word of Flaubert's various drafts available online. The entire project can now be viewed at Les Manuscrits de Madame Bovary Edition Integrale sur le Web. The manuscript must be seen to be believed. Cross-outs, substitutions, and side notes abound. The appearance of the manuscript - all 4500 pages of text all online; yikes! - foreshadows Dada Surrealism. Suffice it to say, as compulsive as he was if Flaubert had used a computer word processing program he'd still be, 152 years later, making changes; the curse of revision made easy. A final word on Flaubert's penmanship skills: non-existent, like a monkey on meth. The major effort on the project was deciphering Flaubert's handwriting for transcription for, wisely, the project has each page of the original manuscript displayed next to a readable transcription of it. Since the site's debut last month, it has been deluged by visitors. For a great swim into the world of Flaubert and Madame Bovary, dive into the flood.